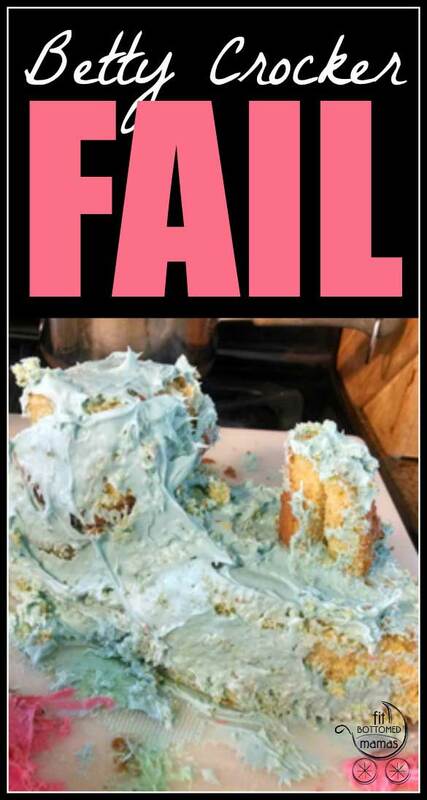 When Kristen shared her failed cake-making adventure over on Fit Bottomed Eats, I laughed with her. But then when Betty Crocker turned against me, I had no choice but to laugh at myself. Hard. 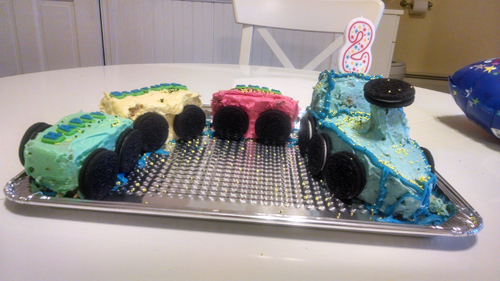 I planned to make a train cake for Owen’s second birthday at the end of February. So like a good mommy of a train-obsessed boy, I searched for “easy train cake” on the internet. Up popped Ms. Betty Crocker with a train cake that looked manageable. I knew not to get in over my head because I recalled Avery’s second birthday in which my husband stepped in and saved the day with a butterfly cake we’d made. Hence Googling “easy train cake” and not “super difficult train cake.” I was on my own, no husband to bail me out, but also no kids to distract me from making what would be a certain masterpiece. So here’s Betty to the rescue, complete with a video detailing how to make this “easy” train cake. I watched the video twice. Felt confident. I got this train cake, I think. Owen is going to love it. The video starts off saying, “You really can do this!” to boost your confidence. This is where the lies begin. They should not tell people they can do this when they have no idea of the LACK OF CAKE ABILITY of viewers. I’ve got a cake mix and two tubs of icing. I bake the cake. I get out my food coloring and color the frosting. I finally give up on getting my icing to turn red when I’ve used half of the red food coloring and have only gotten it to a pinkish hue. Dark pink is good enough, I think. I follow the steps in the video. Mostly. I mean, I didn’t refrigerate the cakes quite as long as recommended by Betty C., so, okay, maybe that’s where the trouble started. I also took some liberties with the design of the engine train because I wasn’t a fan of how Betty did hers, but more on that later. I start to frost my little train cars with the first “crumb coat,” named because you cover the cake and crumbs before you do the “real deal” smooth ice job on top. And whoa. 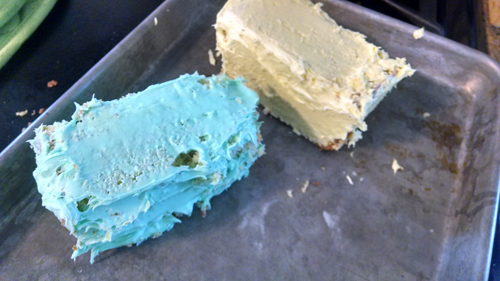 I realize my “crumb coat” is so-named because my cake is crumbling like ancient ruins. What’s going on here? I keep going, determined to get this worked out, and the cake just keeps falling apart. More icing goes on … but no matter how much icing I load up onto my knife (because I’m using a knife, who has a fancy spatula like they said to in the video? Only the pros! 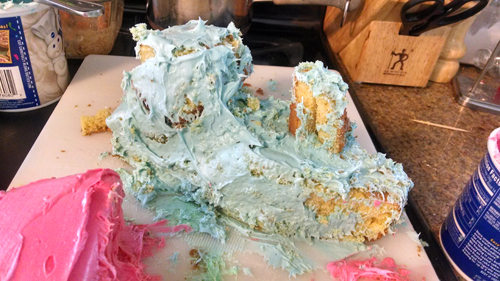 ), my cake just keeps crumbling; the frosting refusing to stick. I get a rough coat on the trains. And by rough, we’re talking rough. Like, “Hmm. May have to chuck this in the trash and run to the grocery store later for an emergency cake” rough. This makes me cry with laughter every time I look at it. And Owen? He totally knew it was a train, which was the most important thing. And by husband said it wasn’t as bad as he thought it was going to be, although he totally raised an eyebrow at my boat-ish engine. 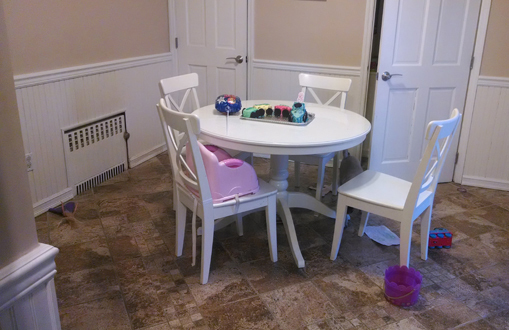 (I’d told him once he saw the progress picture he was going to think I was Martha for having pulled out this birthday miracle.) And wouldn’t you know? The part I didn’t like about Betty’s engine design? The front angled part that totally make it look more like a boat than it would have? Once I started slicing the cake up and chopped that part off, it looked much more train engine than boat, thank you very much. I’m thinking I should start practicing now if I want to make a princess cake for Avery’s birthday in August. Heck, I should start practicing for Owen’s next birthday — even if I attempt an exact repeat of “easy train cake.” Maybe I’ll just make cupcakes and call it good. I loved this post, too cute.